The Binatone Trend 1 Landline Phone (Black) is a compact and corded phone with a call log memory of up to last 35 phone calls. You can keep a check on your incoming, outgoing and missed phone calls easily to keep yourself better updated at all times. The redial button connects you easily to your last dialled contact number. With the flash button, you can attend a second incoming phone call as your phone will flash when a phone is in waiting. The mute button lets you mute your voice during a call and you can unmute to speak again. Make use of Private Branch Exchange Systems in your office with this Trend 1 Landline Phone. The enterprise users can switch calls on local lines and also share a fixed number of external lines. Clear up the space on your desk with the wall mountable design of the Trend 1 Landline Phone. 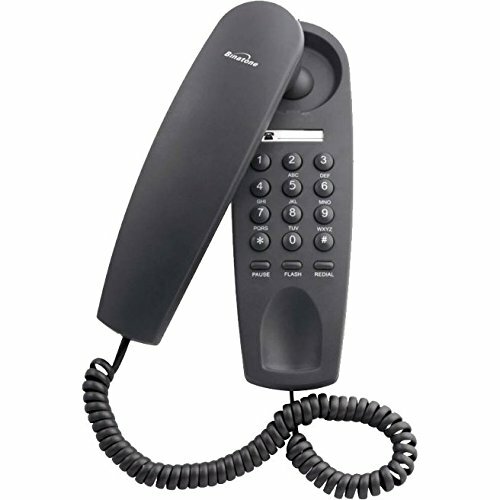 The stylish Trend 1 Corded Landline Phone will look great on your home or office walls.